Spring is in the air. The subtle whiff of fresh blooms and burst of colors from yellow poinciana, red gulmohur, dazzling golden showers or laburnums, gorgeous purples of Queens's crape Myrtle and brilliant multi-colored bougainvilleas dot the landscape around. 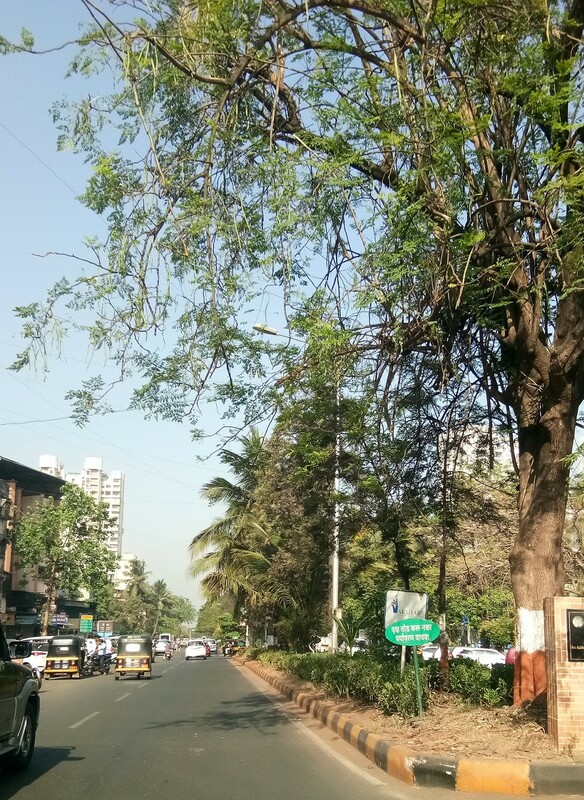 It's time for new beginnings, say the spanking new leaves in varying shades, from delicate blush to glistening greens - a treat to the senses after the rather mild and dry Mumbai winters. The green cover that residents of the city enjoy is all the more delightful with the onset of spring hues. If only the local town-planner knew that he was being blessed and cursed in turns over his casual decision to plant random trees along some streets and on dividers, he might have paid more attention to that matter. Planting silk cotton trees sprouting gorgeous pink blooms was not one of his good ideas. These pink blooms eventually give way to pods that pop open to liberate fluffy bursts of fine cotton flying all over the place, considerately inflicting you with allergies or settling all over your clothes and hair making you look more like plucked chicken than the dapper person you started out as. Here I am dithering about the vagaries of town-planning while for the bustling mami visiting me, the colors of spring are but distractions that take away her focus from the prime catch of spring! So you see, mami was very plainly distressed one fine morning as I took her on a drive to show her the sights and smells of our city. And what triggered that? It was the sight of clusters upon clusters of those delectable, slender morsels of gastronomic ecstasy - moringas or drumsticks swaying, callously ignored at a road divider. Her sudden screech on spotting them had me slamming the brakes with a palpitating heart! "What, what, what?" I exclaimed while mami mutely pointed to the sight in front of her. Tantalizingly low hung branches laden with willowy clusters of healthy drumsticks! In a daze of disbelief she asked, "Doesn't anybody want them?" "Hmm...," I glanced up at what she was looking at and shrugged, more keen to start up the car and zoom on before the irate honking behind my stalled car got worse. "How can people just let all that bounty go waste?" she lamented. "Don't tell me people here don't make drumstick sambar? Your mama will give me no rest unless I add the flavorsome sticks everyday in some form! 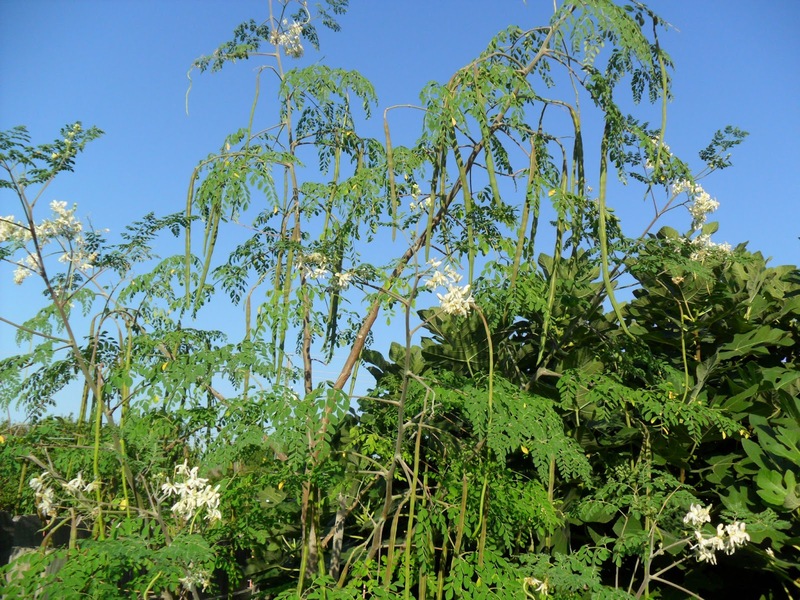 And moringa leaves, they are the super-food world over, didn't you know?" Mami is this vigilante types you see, keeping track of all these Whatsapp forwards on health and holistic living and a dedicated follower of every imaginable Facebook page dedicated to anything food-related. "Well, quite honestly I never noticed till your scream gave me a heart attack over them! So I am guessing no one else did too." "But isn't that like a sheer waste? You know ma, they cost a bomb in the market and that too for scrawnier versions of what we saw! Tch, tch, what a waste, what a waste! Do you happen to have a long stick in your car's dicky?" she asked hopefully. "Of course not!" I replied and hurried on, keeping an eye open for all drumstick trees that might lead to future shrieks, and she failed me not. Every moringa tree we passed, she shrieked without fail. Little did I know that I had to be wary of other botanical diversions as well! "Aiyyo, Ramachandra!" Mami gasped. I swear she was close to convulsions. But I'd been on that path earlier so I didn't brake instantly, simply swerved the car carefully to the left and parked. "Now what is it mami?" I looked around and didn't spot a single long stick dangling from any tree. But I espied what had arrested her attention this time. Bunches upon bunches of tiny raw mangoes or vadus as we call them, gently swaying and casting a luscious fragrance from a mango tree, again bang on a road divider. The road beneath the tree was liberally littered with fragile vadus fallen from the tree now squashed by speeding vehicles. 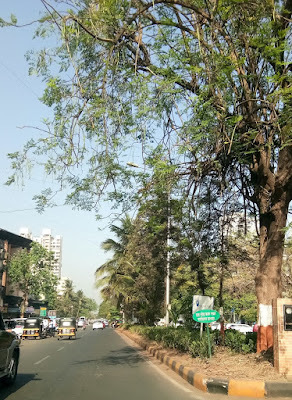 Street urchins and peddlers who abounded traffic signal junctions had probably bypassed raiding this tree since it was in the middle of a high speed lane. "Do you know how difficult it is to lay your hands on good vadus? I have to scour the markets from February and plague my regular vendor to keep aside 3 kilos of the smallest vadus for me and still I get saddled with overgrown, withered ones! See, these vadus lying here are just the right size, not too big, not too small, so tender...," and she went into raptures gushing over the merits of the right vadu size for the perfect maavadu or vadu manga (not to be confused with Japanese comics - mangas) that she annually churns out from her kitchen besides every imaginable kind of pickle one can make! "Can we go pick some out, it is such a shame to let them go waste like this!" she pleaded. I firmly dragged her back into the car, refusing to give in to her pleas. I conceded with, "I'll take you to the sabzi market later, I am sure you'll get buckets of vadus to your liking," while fervently hoping this would be true. 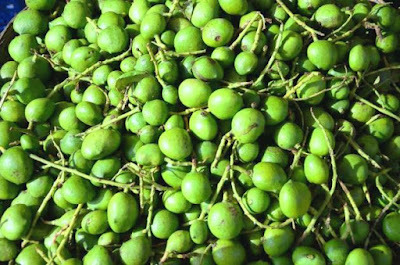 Yes, spring marks the onset of the mango pickle-making ritual for mami. It starts off with vadu mangai and moves on to the spicy hot blaze of avvakai, made in different batches - the traditional Andhra style with gingelly oil, the north-Indian style made with mustard oil and the trendier lot made with olive oil for export to folks living abroad. In between turning over the pickle maturing in jumbo ceramic jars or barnis, mami finds it ridiculous to have meals devoid of any pickle simply because the new batch of avvakai is not ready! According to her precise calculations they will mature reasonably only after three weeks of steeping in the tried and tested blend of oil, salt and spices, no preservatives added. In the meantime, quick-fix urgais or pickles like manga thokku, manga curry or molaga manga, will reign over the dinner table. Summers are not to be wasted bawling over the insane intensity of the sun. Instead mami prays the sun shines brighter over her home-made vadams, appalams and mor milagais laid out to sun-dry on the scorching building terrace. By the time she is satisfied that these fritters are properly toasted, the rest of her menagerie including mama, the maid and any of the kids/grandkids popping over for the vacation, get a proper tan of the third-degree kind while keeping watch to shoo away birds from pecking at the spread. Conferring with neighboring cronies she ensures her larder is stocked with the kiddie favorite chunda and lip-smacking aam panna for a good measure of mango overdose. No sir, you do not dawdle and waste precious sunshine. You may not make hay but there's lots more to do while the sun shines! If mami sees her entertainment diary bereft of any festivals, she believes it makes sense to use that time to stock up on all these meal staples. Staples that could raise your BP if you just knew how much salt went into them! Spring is the time for mami to wrap her saree pallu tightly around the waist and gear up for some extra action on the kitchen front! I am on my way to mami's to pick up the season-special jar of mavudu that she modestly claims is her best batch yet! Drooling in anticipation....!! Oh, I didn't mention what happened when mami spotted the coconut tree-lined street divider, did I? Another time maybe, till later, vanakkam! mami: Refers to a respectful address used for any Tamilian lady (typically TamBrahm) acquaintance, something like the ubiquitous Auntyji though it literally translates to mother's bro's (mama's) wife, mami.